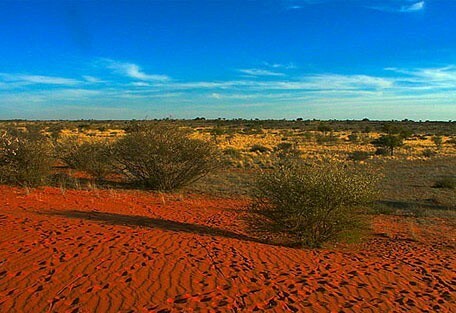 The Northern Cape Province in South Africa extends itself to the aridity of the Kalahari Desert. 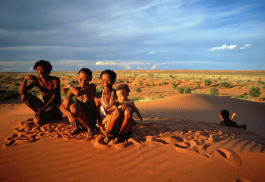 This is where the legendary San Bushmen have lived for 30 000 years. The Kalahari sands of the Northern Cape are transformed by the mighty Orange River, which brings life to South Africa's hottest driest area. The Northern Cape Province in South Africa is the gateway to the Kalahari Desert, which stretches into Namibia and Botswana. 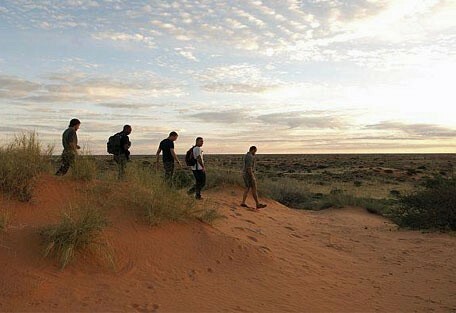 The Kalahari is the world largest desert. The Kalahari is characterised by rich, red sand dunes and is well vegetated with shrubs, patches of trees and even some grasslands. This is where the legendary San Bushmen have lived for 30 000 years. Their legacy of rock art and engravings translate their past lives, but only a small population of the San are left to continue that nomadic hunter-gatherer lifestyle. The Kalahari sands of the Northern Cape are transformed by the mighty Orange River, which brings life to South Africa's hottest, driest area. Along its banks, vineyards thrive and soft fruits like peaches and apricots grow abundandantly. As the river approaches the Augrabies Falls, it divides itself into numerous channels before cascading down the 56 meter high waterfall. The sight and sound of the power of the water will not be easily forgotten. The Southern Kalahari receives more rain than the central, giving it its nickname, the Green Kalahari. The green landscape attracts many grazing animals, and in turn, the predators. 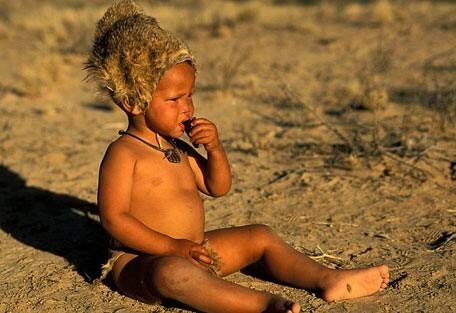 The Kalahari holds the history of the legendary San Bushmen who lived in the desert as long as 30 000 years ago. There are opportunities to visit lodges and natural areas that showcase the historical lives of the San. Where the Orange River meets the Kalahari region is known as the Augrabies Falls. It is thought that there is a fortune in diamonds, washed down by the river into this pool, but its depths are impenetrable and the curiosity continues. 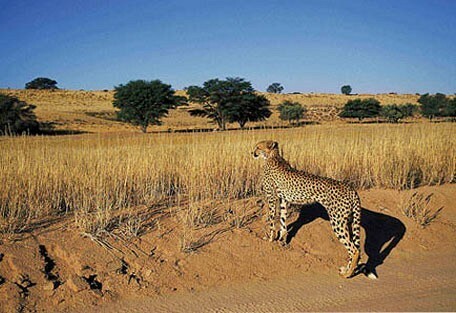 In 1999 the first cross-border collaboration of its kind united South Africa's and Botswana's Kalahari Parks under one name, the Kgalagadi Transfrontier Park. Tswalu Kalahari is South Africa’s largest private game reserve, covering an area of over 100,000 hectares - twice the size of Pilanesberg National Park and bigger than the entire Madikwe reserve. 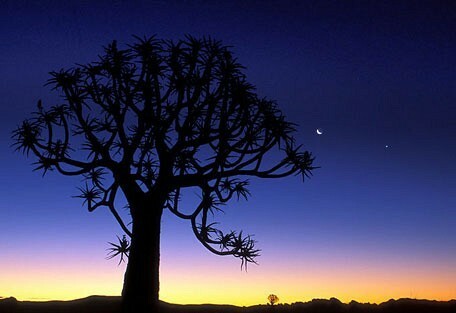 Malaria Free and offers sightings of some of South Africa’s rarest and most extraordinary wildlife. !Xaus Lodge is situated 30 km into the desert, providing luxury accommodation within the South Africa borders of the Kgalagadi Transfrontier Park. Pronounced ‘kaus’, this is a place to experience a unique desert environment. 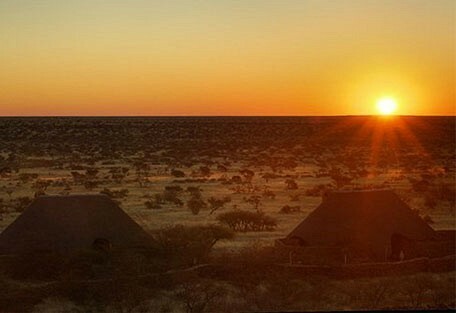 The guesthouse is located within Kuruman in the Kalahari of Northern Cape South Africa. The stunning Casa Linge guesthouse is ideal for guests who look for style, tranquility, luxury, comfort and the renowned hospitality of the Northern Cape. 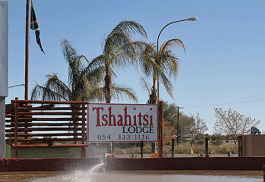 Tshahitsi Lodge is 5 star lodge offering a caravan and 4X4 camper stopover. Each site at the lodge is equipped with air, water and power points. The lodge even has television and with selected DSTV channels. There is a number of amazingly adapted species that call this desert their home. 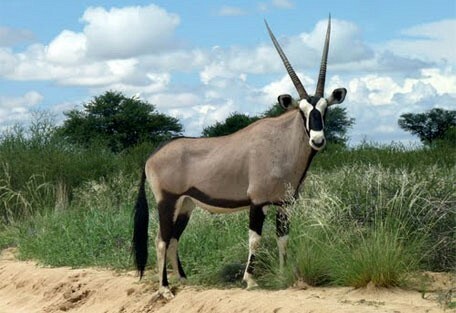 The gemsbok (oryx) is supremely adapted to the desert environment and can go for months without water as it reabsorbs its own waste fluids and barely sweats. 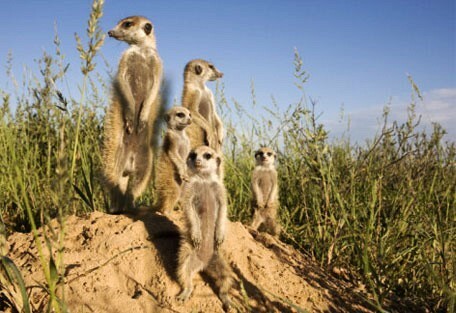 The meerkat, or suricate, epitomises the Kalahari. These mongoose-like creatures scamper around in gregarious packs, foraging for scorpions, beetles, lizards and mice and scatter at the first sign of danger from an eagle or other predator. After the rains, the large-scale migration of gemsbok, springbok, blue wildebeest, eland and red hartebeest creates a wonderful sight, as they follow their instincts in order to find better pastures. Such a good supply of food attracts carnivores like lion, leopard and cheetah, while other distinctive creatures of the Kalahari are small monogamous bat-eared foxes, brown hyena, and birds of prey. 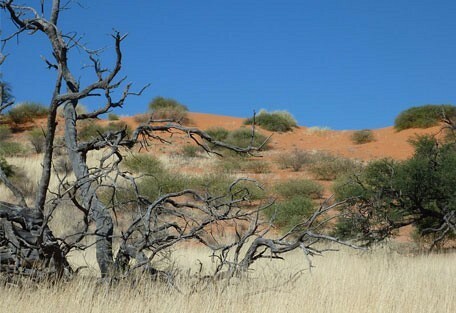 Spring and early summer in the Kalahari occurs between September and December and is dry and warm. January is exceptionally hot with temperatures reaching up to 40 degress Celcius and summer reaches its peak. This is also when the rain arrives. The very hot, late summer months of January to March are accompanied by incredible thunderstorms, which characterise the season. It is somewhat beautiful to experience thunderstorms in a desert area. The cooler winter months arrive in April and last until September and are probably the best times to visit the Kalahari. The days are clear and warm, but the nights can get drop to extremely cold temperatures, and one is recommended to prepare for cold, yet dry weather. Tswalu Private Game Reserve is South Africa’s largest private game reserve, covering an area of over 100,000 hectares. Tswalu is malaria-free and has superlative game, offering sightings of some of South Africa’s rarest and most extraordinary wildlife. Each luxurious suite at Tswalu Lodge has a private deck overlooking a busy waterhole that is frequented by many wild members of the Kalahari. There is a focus on conservation, while game activities are tailored to guests' desires. 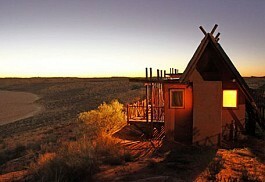 !Xaus Lodge provides luxury accommodation within the South Africa borders of the Kgalagadi Transfrontier Park. Home to a wide population of carnivores, and offering interaction with the Bushmen living in the Kalahari, !Xaus Lodge has a superbly balanced desert safari experience. The Kalahari Desert, and the Kgalagadi Transfrontier Park are some of the best self-drive destinations in South Africa; a firm favourite among locals who set out with 4x4 vehicles and camping equipment for the wild experience. Guests landing at Cape Town International or OR Tambo Airports in South Africa can either rent suitable vehicles or meet up with private guides. It is a long, yet enjoyable, drive to the entrance of the Kgalagadi Park; however, flying into the Northern Cape and driving from there would be more suitable for guests with time contraints.